MARCH RIGHT INTO ART MADNESS AT THE PEARL LIBRARY! Come March you might not recognize the Pearl Public Library when you walk in OK! Seriously folks, it gets kinda art crazy around the place. You wanna know why?! Because it's National Youth Art Month! It's madness I tell ya! M - ART - CH MADNESS! 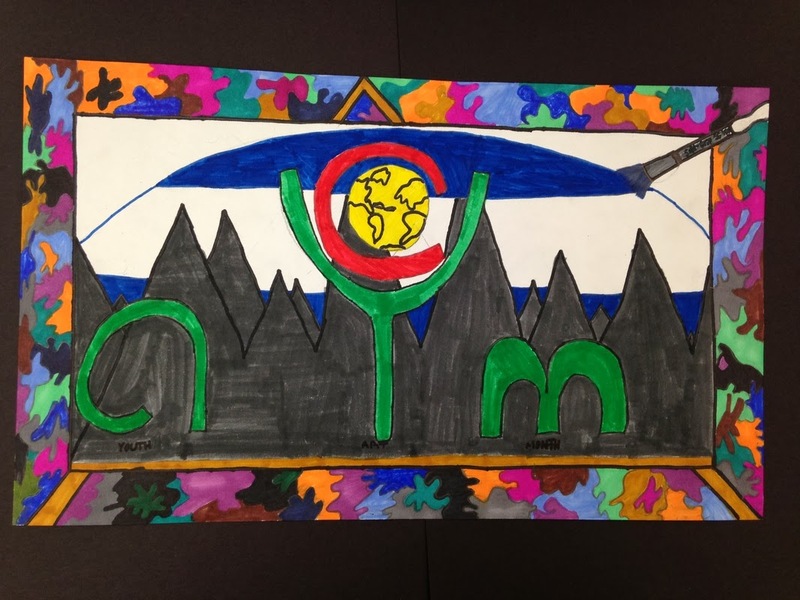 The library will literally turn into a wonderful art gallery with colorful, creative students' art - all from the Pearl Public School District - canvassing almost the whole library! You gotta see this! A reception on Tues. March 4 from 5:30 p.m. to 7 p.m. will kick things off. Hundreds (and I do mean huuuuuuuuuuuuundreds) of supporters will turn out for this reception, enjoy some refreshments and stroll around the library to see all the gorgeous work these kids work so hard to produce! The art work will stay up the entire month of March for all to enjoy! ADORNING CRAFT AT THE PEARL LIBRARY! You simply cannot beat fun, beautiful jewelry making, and Eleanor has March's Simply Crafts night looking pretty darn good! 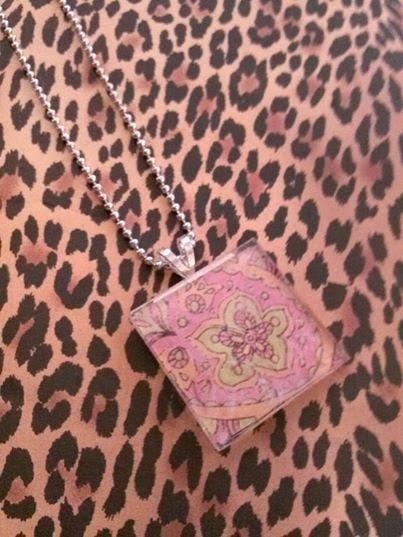 How about tile glass pendants? The craft calls for beveled glass tiles, scrapbook paper, Modge Podge and bails and chains! You do not want to miss this craft night full of creative fun on Tues. March 11 at 6 p.m. No registration is required. All materials are furnished. And, then there's the morning session of March's Simply Crafts's double header - same day , but at 10:30 a.m. when Shirley will take you into the world of rug making using cloth. This craft is called Rags to Rugs. Does it sound familiar? It should. This is Shirley's third month of Rags to Rugs crafting! It looks like this one may be her biggest class yet with so many already signed up although no registration is required. Please bring any old t-shirts or cloth you might have on hand. We sure hope to see you at the Pearl Public Library where crafting is always simple and creatively entertaining! The Pearl Library's Chapter 1 Book Club's live author's visit was a huge success and everyone had a fabulous time said Cecelia, the book club's leader. The Skype visit took place on Thurs. Feb. 13. "It is so exciting to be able to visit live with a best-selling author," said Cecelia speaking of author Becky Aikman. "Becky lives in New York but called us from Los Angeles where she was for a book signing." Aikman must have been great, and really down to earth because Cecelia said, "I could hang out with her! Becky was friendly, funny, entertaining and very generous with her time. She updated us on 'The Blossoms' as the five, young widows dubbed themselves. They are still friends. They keep in contact with one another and get together periodically." 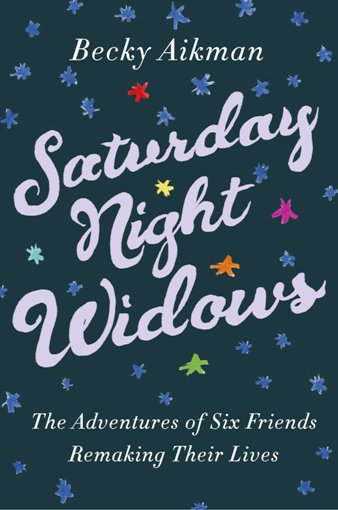 Here's what Saturday Night Widows is about: Journalist and former Newsday reporter, Aikman lost her husband to cancer when she was in her forties. Sad and lonely she tried a support group. All she felt was more sad, and that was not working for her. She knew she had to get busy reinventing herself. Aikman researched what had been written about dealing with loss. Later, she remarried, but the traumatic loss was still present so Aikman found herself putting the valuable research to work. By asking around, Aikman was able to form her own group of young widows. Remarried for four years by the group's first meeting, Aikman also had new challenges to tackle. As if grief issues weren't enough, she now had to deal with a "new life, new career, new husband, new stepdaughter, new home and new dog," as she put it. Her mission was to balance a new life with memories from the past. Not an easy feat, but with five new friends, a lot of laughter and a few tears, Aikman made it work! A Skype visit takes a book club meeting to another level said Cecelia. "If you or someone you know is in a book club, a Skype visit with an author makes a very unique program," she said. "Many authors, especially new ones, will work with you on speaking to your group." The Pearl Chapter 1 Book Club meets every 2nd Thursday from 6:00 – 7:00 P.M. All are welcome to attend. 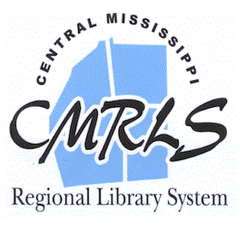 If you would like to read along with the group, inquire at the Pearl Library for the current month’s selection at 601-932-2562 or on our website at www.cmrls.lib.ms.us. SWEET AND HOT LIBRARY LOVE IN PEARL! The Pearl Public Library's sixth annual Come in from the Cold with a Good Book was a tremendous success with upward of 1,200 patrons participating during the three-day event to support the Friends of the Pearl Library! 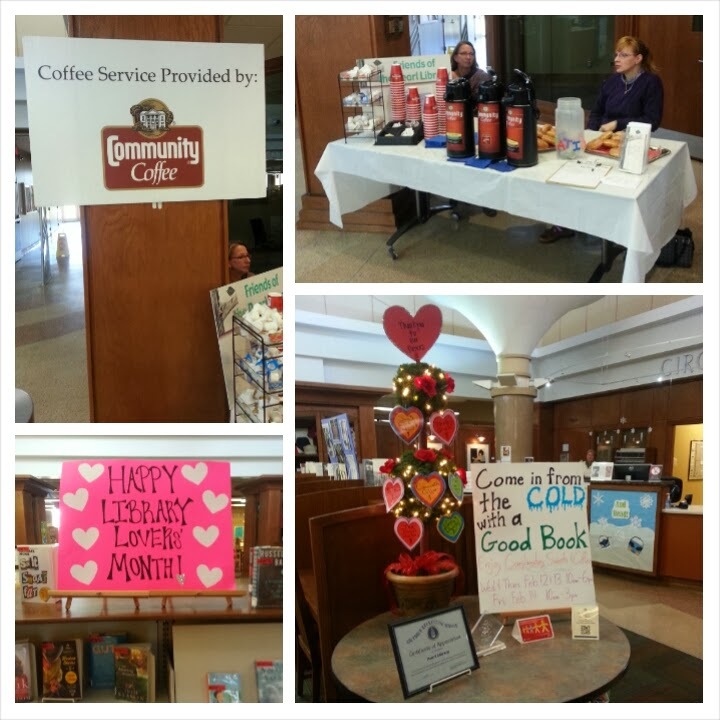 We heard "I love my library" over and over and over again as patrons happily enjoyed tons of free Community Coffee ( PECAN PRALINE ROCKS! ), donuts and cookies Wed. Feb. 12 thru Fri. Feb. 14, that special love day!!!! Many patrons donated money to the Friends and/or expressed interest in becoming a Friends member. Some took an application to go while a couple of them signed up on the spot and paid their membership! YAY!!! A big LOVIN' thanks to local business donors, Community Coffee, Dunkin' Donuts, That Special Touch, The Donut Factory, Western Sizzlin', Sam's and Wal-Mar for helping make this Library Lovers' Month celebration possible! And, thanks to the Friends of the Library for lending the library staff a helping hand. Last but not least, thanks to our AWESOME patrons for making it so much fun! Library Lovers' Month is in full swing and the Pearl Public Library is gearing up for its sixth annual Come in From the Cold With a Good Book! The event, sponsored by area businesses, in support of the Friends of the Pearl Library, starts tomorrow Wed. Feb. 12 and runs through Valentine's Day, Fri. Feb. 14! Free donuts, cookies and coffee, made possible by Community Coffee, Dunkin' Donuts, The Donut Factory, That Special Touch, Sam's Club, Wal-Mart and Western Sizzlin', will be provided for all patrons visiting the library from 10 a.m. to 6 p.m. on Wednesday and Thursday and 10 a.m. to 3 p.m. on Friday. You don't want to miss this LOVELY event! The library welcomes all to come enjoy something sweet and a hot beverage, meet library staff and learn about the Friends of the Library. Who knows, you might even want to join and become a Friends member yourself! Donations to the Friends will be sweetly and warmly welcome! Oh, by the way, just a reminder that the library's adult winter program, Snuggle Up and Read!, is going on right now and will run clear through Library Lover's Month, ending Feb. 28. 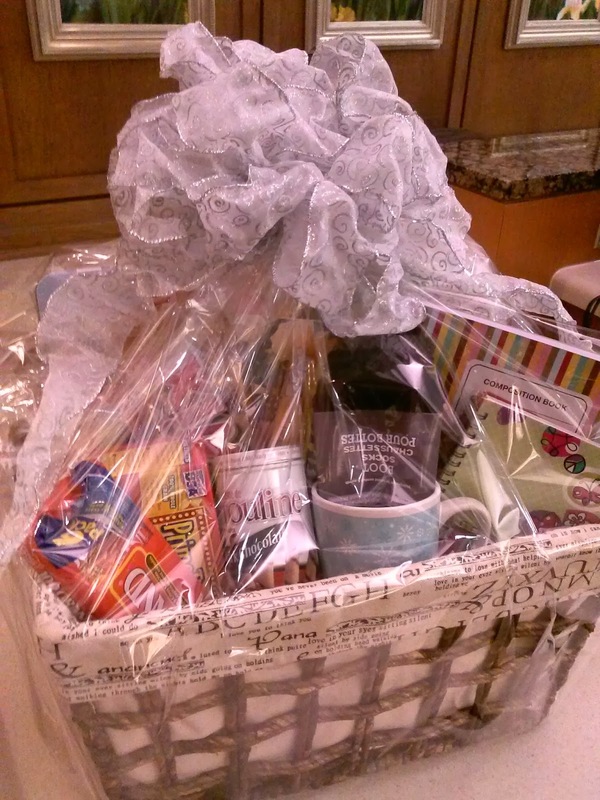 The person who reads the most, wins this pictured basket full of amazing prizes!